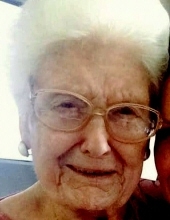 Margaret Gruben, nee Jones, age 102, a resident of Plainfield, IL since 1941, passed away peacefully on January 23, 2019. She was born on November 26, 1916 in Joliet, IL. Marge is survived by her loving sons, Bruce (Jean) Gruben and Stephen (Rebecca) Gruben, both of Plainfield, IL; her cherished grandchildren, Michael (Janet) Gruben, Julie (Rob) Brinkman, Meredith (David) Avery, Peter (Julie) Gruben, Bruce (Melissa) Gruben, Thomas Gruben, Jennifer (Keith) Searls and Jason (Lindsay) Gruben; her numerous great-grandchildren. She was preceded in death by her beloved husband, Richard Gruben; her sons, Richard (the late Pamela) Gruben, Jr. and David Gruben; her granddaughter, Kim (the late Allan) Jelm; and her siblings, Veronica Hylka, Marie Schwab, Helen Williamson and James Jones. Marge was a graduate of St. Francis Academy, Joliet, Class of 1935, and lifelong member of the St. Francis Academy Alumni Association. She was a member of St. Mary Immaculate Catholic Church since 1941, served as a Eucharistic Minister and was a recipient of the St. Mary’s C.C.W. Woman of the Year award. She also volunteered her time for the Plainfield Interfaith Food Pantry. She co-owned Gruben’s Tavern in Joliet from 1968-1978 and was employed as the receptionist at Dr. Schmitz office from 1977-2002. Her loving smile and kind heart will be deeply missed by all who knew and loved her. For those who would like to leave a lasting tribute to the life of Margaret Gruben, memorial donations may be made to the Mantellate Servant Sisters of Mary, 16949 S. Drauden Rd, Plainfield 60586 or Joliet Area Community Hospice, 250 Water Stone Circle, Joliet, IL 60431. Visitation will be Sunday, January 27, 4:00-8:00 PM at the Overman-Jones Funeral Home & Cremation Services, corner of Routes 30 & 59, Plainfield. The Mass of Christian Burial will be celebrated on Monday, January 28, 11:00 AM at St. Mary Immaculate Catholic Church, 15629 S. Route 59, Plainfield. Interment will follow at Resurrection Cemetery, Romeoville. To send flowers or a remembrance gift to the family of Margaret C. Gruben, please visit our Tribute Store. "Email Address" would like to share the life celebration of Margaret C. Gruben. Click on the "link" to go to share a favorite memory or leave a condolence message for the family.